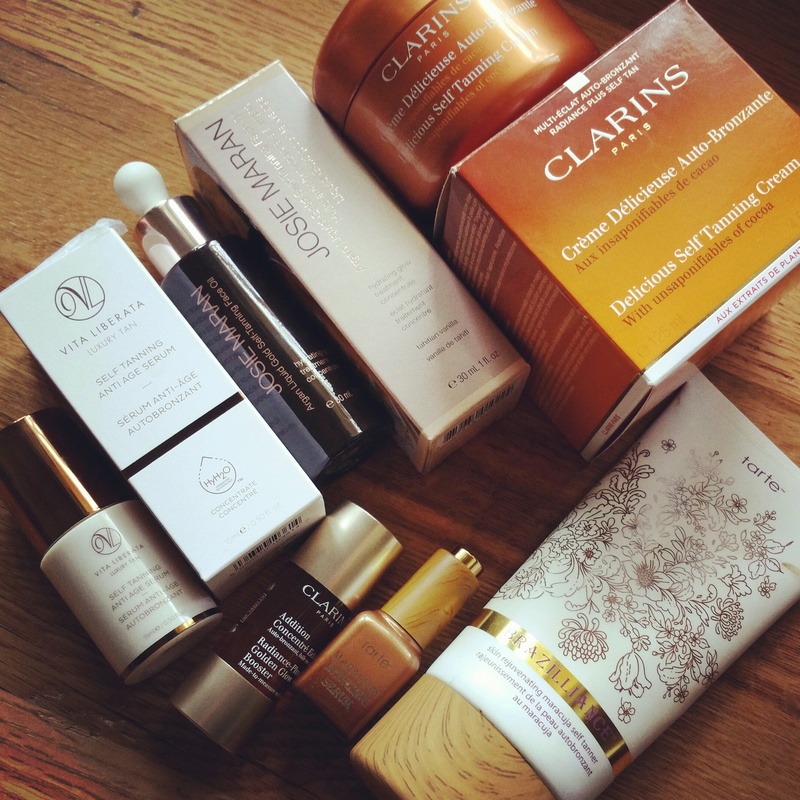 Left to right/ clockwise: Vita Liberata Self Tanning Anti-Age Serum; Josie Maran Argan Liquid Gold Self Tanning Face Oil; Clarins Delicious Self-Tanning Cream; Tarte Brazilliance Maracuja Self Tanning Lotion; Tarte Maracuja Bronzing Oil; and Clarins Radiance-Plus Golden Glow Bronzer. Even though I’m only a consumer, I consider myself somewhat of an expert in self tanning. I self-tan my face year round and my body in the warmer months. It makes me feel so much better about my appearance. I have used a crazy number of different brands and types in the past 2 decades, and I go through tubes and bottles regularly. If you regularly use self tanners as I do, then you’ve almost certainly noticed how much they’ve evolved over the years. And perhaps, like me, you’ve tried them all: from spray, to mousse, to lotion, to gel, to cream, to wipe, to powder, to liquid, to oil, and to serum. From the start it was a love/hate thing with self tanners. You know why: the mess, the streaks, the stickiness, the product smell, the DHA smell once it reacts with skin, and the price. But things are a lot better than they used to be. I don’t feel the need to ever again use a messy spray or mousse, that inevitably makes me hate my skin until I can wash it off, and also paint my bathroom along the way. I also know I can get a good tan without smelling like a flower (St. Tropez mousses and sprays, you’re awesome, but I cannot stand the way you smell). 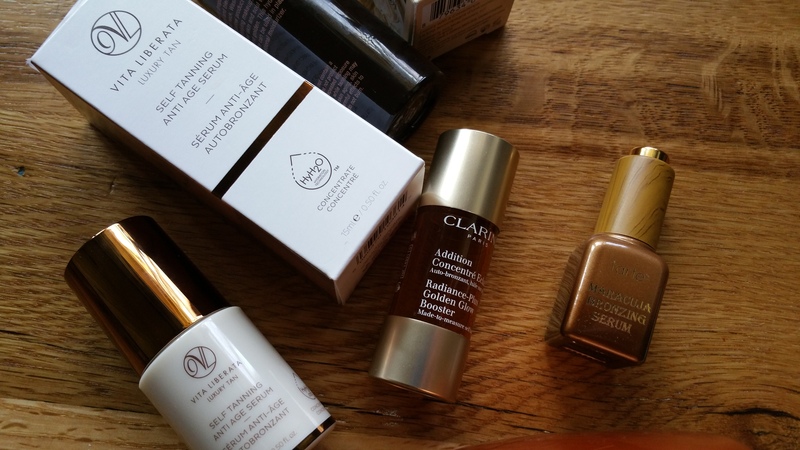 The New Breed: Left to right: Vita Liberata Self Tanning Anti-Age Serum; Tarte Maracuja Bronzing Oil; and Clarins Radiance-Plus Golden Glow Bronzer. Things improved so much when the oils and serums came out. The first oil self-tanner I ever saw and tried was St. Tropez, which was miraculously unscented in this form. Once I got the hang of using it I was impressed with the results that came from the oil. But it had a tendency to highlight defects on my face and stick to dry areas, even with regular exfoliation. Of course I always read the labels on self tanners (and every other cosmetic!) to see if it’s safe for me and doesn’t contain petroleum, irritants, or gluten. For self tanners I also check how far up DHA ranks. I am so done with self tanners that produce little color. I don’t want a gradual tan, nor did I ever. I want pure DHA. And we’re getting there with this new breed of self tanners. Once I got it home I knew I would be using this serum directly on my skin, instead of mixing it with face lotion or cream. 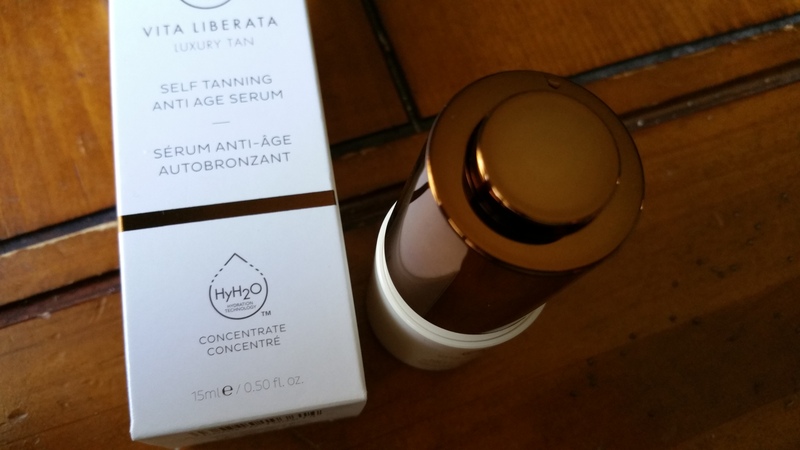 That’s because I saw that the serum contains my holy grail face smoothing ingredient: dimethicone. I have learned this provides the texture I like in a facial product. I like the slip it provides, and I also know that it is the primary ingredient in a makeup primer. So maybe my makeup will stay on well while I’m tanning. Water, Dimethicone Crosspolymer, Neopentyl Glycol Diheptanoate, Dihydroxyacetone***, Glycerin*, Xanthan Gum, Sodium Chloride, Rose Extract** Cucumis Sativus (Cucumber) Extract*, Sodium benzoate, Palmitoyl Oligopeptide – Palmitoyl Tetrapeptide-7, Potassium Sorbate. *Organic. **Natural. ***Ecocert. 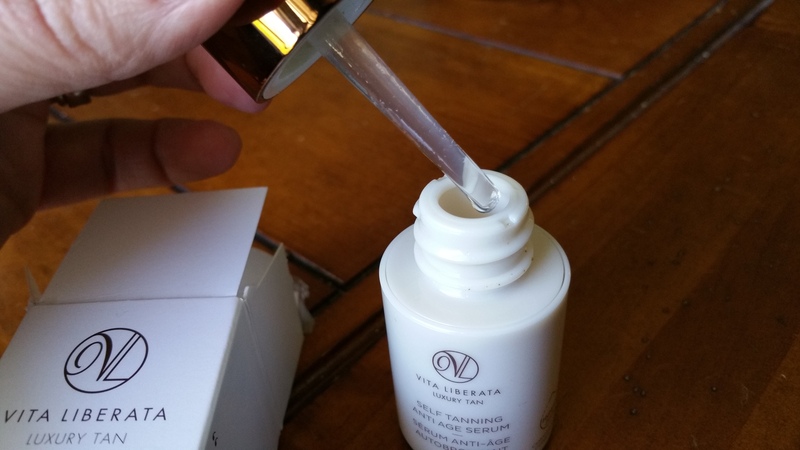 Vita Liberata’s serum comes in a screw off bottle with a dropper into the lid. When screwed on the dropper cannot be depressed. Once opened you can dispense dropper fulls of product. I find that just one dropper full is enough for my face. I think the silicone really helps this product smooth on the skin and also prevents it from attaching itself to the dry skin on my hands. This results in less waste. I would definitely buy this serum again. It produces very nice color, goes on smoothly, doesn’t interfere with makeup (non-tinted), and doesn’t make me sweat! It’s awesome that it soaks into my skin and allows me to forget I used it. ….But still I haven’t found perfection. 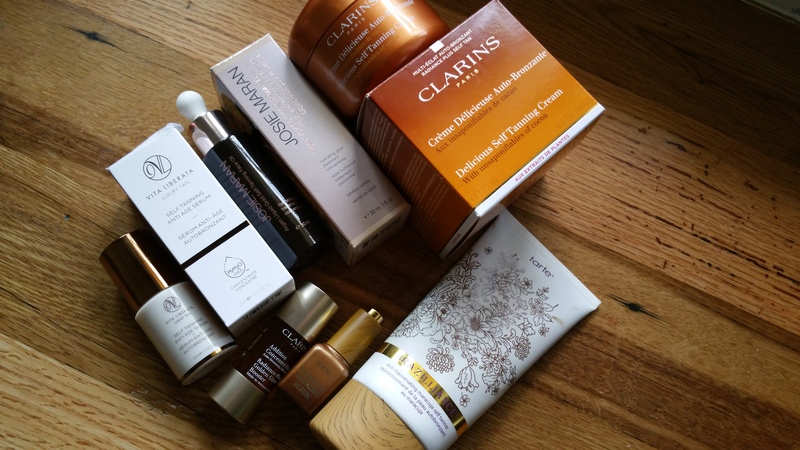 Left to right/ clockwise: Vita Liberata Self Tanning Anti-Age Serum; Josie Maran Argan Liquid Gold Self Tanning Face Oil; Clarins Delicious Self-Tanning Cream; Tarte Brazilliance Self Tanning Lotion; Tarte Maracuja Bronzing Oil; and Clarins Radiance-Plus Golden Glow Bronzer.